Thank you Judi H. for sending this beautiful prayer. This is a Valentine that my husband gave to his father for Valentines day in the early 1940's. We are so fortunate to have it! We need to frame it but it is remarkably preserved considering the papers were not acid free. The colors are vibrant and there are no tears on the edges of this sweet card. It is quite large, measuring 9" high by 8" wide and the tab on the cow moves to lift the little boy off of his feet and into the air! There are 2 fold in tabs on the bottom to make this card stand up and they are still intact. I love this card and thank his sisters for finding and giving this card to us! My sister-in-law and I have our own little book club going! She just recently sent the Glass Castle to me to read and return when she comes to visit in September. We share a love for Maeve Binchy, Nora Roberts, Nicholas Sparks and many more authors. While reading The Glass Castle, I was truly inspired to take my own autobiography off the dusty shelf and begin to finish it. The parallels to my own life growing up were eerily familiar. I find this type of book a purging, therapeutic read and at first reading thought, Wow!, someone has written MY book - ha! Anyhow, I have added a bookshelf to my Two Happy site so you can see what I am reading, have read and would like to read. Shelfari is a great site where you can discuss your favorite books with others who share your interest as well as download the bookshelf you build to your blog sites or even FACE BOOK. It is worth your checking out. Do you have childhood memoirs of overcoming tribulations, incidents that have strengthened your character? Consider writing your own autobiography even if it is just for your children. May I recommend while I am at it, my Son-in-Law's novel, "School Shooter" by Mark Frye, to parents of High School students and to students also. Amazon has a 5 star review for it. The publisher chose the name and changed it from what my Son-in-law had written. But don't let the name throw you off. This book is essential to understanding the youth today and their struggles to fit into society. The author has worked for more than 10 yrs. in the school system and has taught Library Science and Audio Visual Aides and Methods for Elementary, Middle and High School and Coastal Carolina College. GROUP HUG for the Birthday Boy! Papa and the "kids". It was a happy and fun 70th for my hubby. Bill is 70 today! He does not look or feel that many years even with his illness! He is feeling pretty well today after an almost sleepless night. Sometimes he feels a little sick for no apparent reason and is sort of a couch potato today. Our daughter that lives here in SC is coming over after work to see him and he has had bunches of birthday cards and wishes over the phone, on line as well. Thanks to all those who celebrate his birthday with us today. as I never want the day to cease. There is nothing left but glowing peace. As I was writings just now, I had visitors in the back yard. These are the young adults from this years Canadian Geese families. Their parents come every year and raise their young. They soon get over populated and every June, our community has a Geese round-up and relocate them. They also do this with the Swans. It is necessary but I hate to see them go. They wait until the babies can fly and then thin out the numbers. You can tell that they are young adults as there is no fighting and they are not territorial. It is great to see and study them up close and personal. My computer location in the den is much nicer than in the 2nd bedroom closet - ha! I have a view now. So on this quiet Saturday morning I want to share my view with you. From my desk I can look out over the back lawn and see raindrops on the water, our little lily pond and the beautiful wood Egret that Bill cut out for me. Though the weather is dreary, the backyard is always cheery with little cameo's in every corner. There is a fisherman of cement by the base of our Bradford Pear tree, the mold for which was created some 36 years ago by an Artist in our home town. He carved the original from wood and then created the rubber mold. He made more than one mold and gave one to Bill. So the fisherman has been in all the yards that we've occupied from then until now. I love looking out over our little domain that is alive with birds, butterflies, bunnies and sometimes raccoons and red fox. It is like hidden treasure being so close to a tourist city, like a sanctuary in the middle of the busy, noisy highways. You would never guess that all the wildlife is here. Please double click on the photo to enlarge. The beautiful picture of Blue Bird Mother feeding her chick is an example of my husband's photography skills. We have a whole series of photo's showing the Blue Bird family raising 2 different broods this spring and summer. There are other stages of their nesting on my blog site: http://beaver-kerrie.blogspot.com/ TWO HAPPY. That site has how-to's, crafts, free patterns and directions, my husband's skilled scrollsaw work and more. Do visit that blog site, also. Thanks fro visiting and come again! 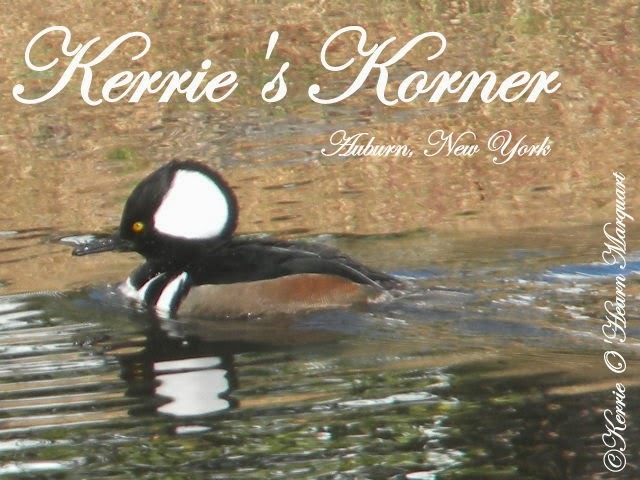 All writings, photographs and material et al, are copyrighted by Kerrie O'Hearn Marquart and cannot be copied or reproduced in any manner without permission by the author. Please respect all blogger's ownership rights. This is my Mama holding my brother George, her first born. She told me the story of this type of picture called a Tintype. (History of Photography by Robert Leggat, "The Tintype Process). She said a man with a pony and a camera came along the street door to door and wanted to take a picture of my brother on the pony. Mama said that George was very afraid and cried. So the man made this picture and gave it to my mother. It would seem that George is still looking at the pony with a hesitant expression. I love this picture. My Mom was just a little person, no more than 5 feet tall and as you can see does not weigh but 100 pounds or less! She maintained her youthful look and beautiful smooth skin throughout her life, never wore make up. She was sweet and kind and everyone loved her. She has been gone many years now but left us at the age of 90. And bless my days from morn till end. Lord you are so amazing! This is a picture that I painted in acrylics when we camped in a cottage on Owasco Lake, NY one October. We had the whole array of seasonal changes while there from Indian Summer when we went boating with friends to snow falling in big, big flakes and covering the deck! It was a time of rest and renewal for us as well as visiting friends and family from there on the lake. Bill is in the boat and fishing for that one big whopper! I took time to read, paint, draw, take pictures and even weeded and planted fresh Mums on the little terraced bank behind the cottage! Remembrances include a Bonn fire on the beach with our son and family, kayaking, walking, seeing deer every day, having family over, lots of fires in the fireplace and waking to 50's temps inside. We loved every precious moment that we spent that October and made memories to last a lifetime. Hey! I have been having so much fun with Face Book and my family! I am now in tune with the children, friends and grandchildren whenever I want to see what they are doing! Such fun! My eldest granddaughter posted this picture last night that I had not seen before. 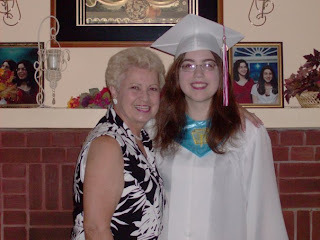 It was taken of us at her HS graduation last June 2008. She starts her 2nd year of college this fall. Where has all the time gone? Summer is still very hot in SC and humming along. I heard the locusts singing when I went out this morning, an indication of still more hot weather. I have been trying to organize some of my writings so I can post them soon. Meanwhile the photos my hubby takes are great and will be featured whenever I can download them. Last night at sunset, there was this beautiful sky.... God is Good, he colors our lives. I have always wanted my very own Lily Pond. It is very small but very large in enjoyment! This beautiful blossom is the first this summer. Tell us if you like it. When we cleaned this tiny pond in the Spring, a very large bull frog who was hybernating there jumped out to our surprise! Hummingbirds are sure hard to catch on camera but my hubby finally got this one photo so far of the elusive little darlings! He is actually sitting with no wing activity! They are so much fun to watch and of course we are hoping to get a wing-spread photo but sometimes they leave while you are turning on the camera - that quick. The bunnies on the other hand, are not shy at all and this little guy or gal was very unconcerned with our opening the window above him and snapping pictures!